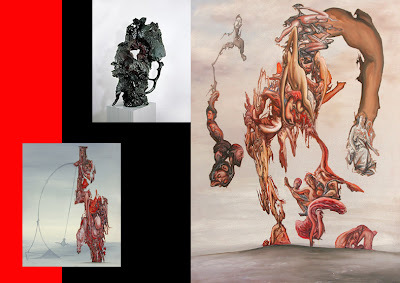 Jacques de Beaufort: joel morrison, steven gontarski, thomas helbig..
joel morrison, steven gontarski, thomas helbig..
...are three sculptors I'm very interested in lately. 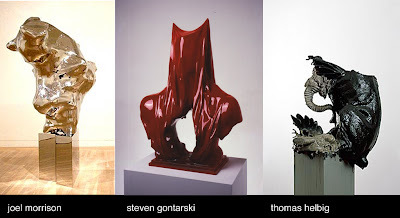 Thomas Helbig's current show at China Art Objects reminded me of the other two artists. The show felt thin..I'm not a fan of his 2-d work..but his sculpture is great. I thought I was the only type of person who appreciated this variety of grotesque fantasy so it's a pleasure to see it in places other than my own imagination. I think the paintings I made last year are a type of analog to the formal concepts all three of these artists are playing with. It has to do with post-figural mutation. It's like the scene in "Aliens" when Sigourney Weaver discovers all the mutated alien fetuses. Or maybe some kind of curio cabinet in a dark dusty Eastern European museum with a 2 headed cow floating in fromaldahyde..well you get what I mean. Only Morrison and Gontarski are a bit slick..and maybe Helbig's biomorphism has a textural verism that brings it closer to the sickly unsettling organic presence that I'm after.